Increased the amount of credits and experience earned for damage dealt by other players to targets sighted by the player. Due to this change, average earnings per battle have been increased by 1,5%-3% for aircraft carriers, battleships and cruisers, and by 2%-4% for destroyers. In the battle HUD, aircraft names will now be replaced with aircraft Tiers when the alternative battle interface mode is enabled. Full aircraft names that were previously used had poor legibility and did not contain any significantly useful information. Icons of destroyed ships displayed on the Minimap will now be noticeably different to icons of spotted ships (icons of destroyed ships became darker). On the Minimap, ship names will now be displayed when the alternative battle interface mode is enabled. Added a timer to the base/key area capture progress indicator upon capturing. This timer shows the time remaining until the base/key area is captured and will only be shown for those who are within the capture circle. Added an icon next to the ship’s HP bar in the dynamic ship icon. This icon shows the currently bound key for the “Show Ship Status” control. By default, the [H] key is bound to this control. Ambient sounds will now be played according to the current map. Improved sounds of main gun shots for some ships. Improved sounds for AA armament. Improved sounds for shells hitting the water. Implemented support for Multisample Antialiasing (MSAA). 2x, 4x, and 8x antialiasing can be enabled via the graphics settings, provided that the graphics card supports the “INTZ” texture format (this format is supported by virtually all currently available graphics cards). Please keep in mind that it is necessary to update graphics cards drivers in time for the best performance. Inviting players to join the clan and accepting players into the clan. Removing players from the clan. Creating the clan tag and displaying it in battles. Chat room for clan players. Reworked the models of Japanese destroyers Shimakaze and Shinonome in line with new visual quality standards. We changed the appearance of small objects such as ropes, lines, and guard railings. Moreover, Shimakaze now boasts an updated model for her main guns. We plan to rework models for all ships in the game in future. Fixed a bug where the timer on the icon for incapacitated main guns, was stuck at zero. Fixed a bug where main guns’ reload progress was displayed incorrectly. Fixed a bug where the air group icon was displayed after its carrier ship (controlled by the player) had been destroyed. Fixed a bug where displayed ribbons overlapped in the battle HUD. Fixed a bug where backward sorting worked incorrectly in ship filters. Fixed a bug that caused increases in ship performance characteristics to be displayed incorrectly when a camouflage scheme was selected for a ship with that camouflage scheme already mounted on her. Fixed a bug where ships’ HP bars were displayed incorrectly on some computer configurations. Fixed an error where an incorrect message was displayed upon the destruction of the player’s ship by a Fort. Fixed a bug that caused searches for players looking to join a Division to work incorrectly if the player was banned from chat. Fixed an error where key area icons were displayed incorrectly. Fixed a bug where circles showing engagement area radius for secondary and/or AA armament were still displayed in the Minimap after all mounts of the corresponding type had been destroyed. Fixed a bug where the base/key area capture progress indicator did not show any capture progress after the player re-joined the battle. Fixed a bug where the filter for Team Battles was still displayed in the filter panel during periods of time when Team Battles were unavailable. Fixed a bug that caused ship names to be displayed in the wrong case in some situations. Fixed a bug that caused the selector for auto-purchase to be displayed incorrectly for permanent camouflage schemes. Fixed a bug that caused the crosshairs for main guns/torpedo tubes to be displayed incorrectly when only some mounts were fully ready to fire/launch torpedoes. The current Port will now be automatically changed to the Premium Port after Premium Account time is purchased. Optimised the usage of system memory (RAM) and graphics card memory at low graphics quality settings. Reports for misbehavior in chat will no longer be taken into account if the reported player did not write anything in the battle chat before the moment they were reported. 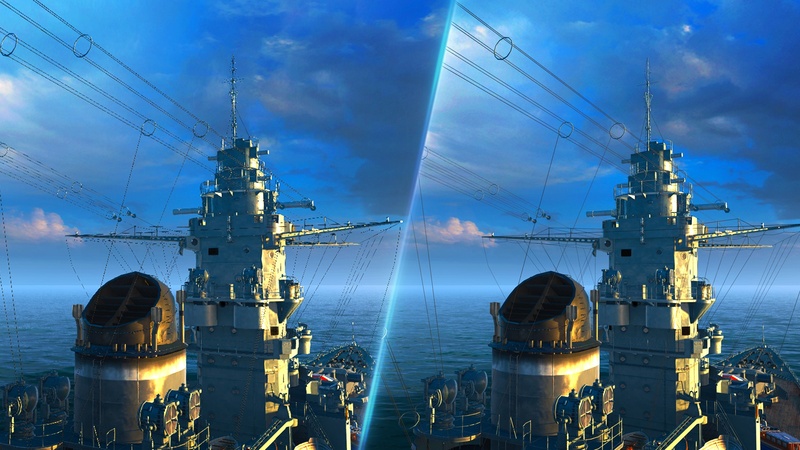 305mm HE shell price for Tier V Battleship König has been decreased from 55 credits to 50 credits to make it correspond with the price of AP shells. Kaiser: Fixed the range finder location. Belfast: Changed visual model of the radar. Animation settings have been adjusted. Murmansk: Fixed camouflage display on main guns. Weymouth: Draught has been increased by 21 cm. Fubuki: AA has been changed for hull A to ensure higher historical accuracy. AA aura radius and strength has been decreased from 3,1 km and 15 damage per second to 1,2 km and 4 damage per second. Fubuki (Hull A): Updated the hull model using the special technology for display of hand ropes and other thick objects on the ship. Tirpitz: Changed the thickness of the rare plating for the main caliber turrets from 220 mm to 320 mm. Kaiser: Fixed camera on the fore main turret. Now the AA guns, located on the fore main turret, no longer interfere with the view in the close-up camera. Nagato: Excessive 100 mm from barbettes inside the citadels on the aft turret have been deleted for the top hull. Edinburgh: Switched AA guns between each other on the stock hull. Aura effectiveness hasn’t changed. Prinz Eugen and Admiral Hipper: The 1st and 4th main turret armor thickness has been increased from 60 mm to 90 mm. Shimakaze: Updated hull model using the special technology for display of hand ropes and other thick objects on the ship; updated main caliber guns, range finders, housings models. Halloween Mode “Saving Transylvania” has been turned off. Previous Entry World of Warships – Steven Seagal is on Board!